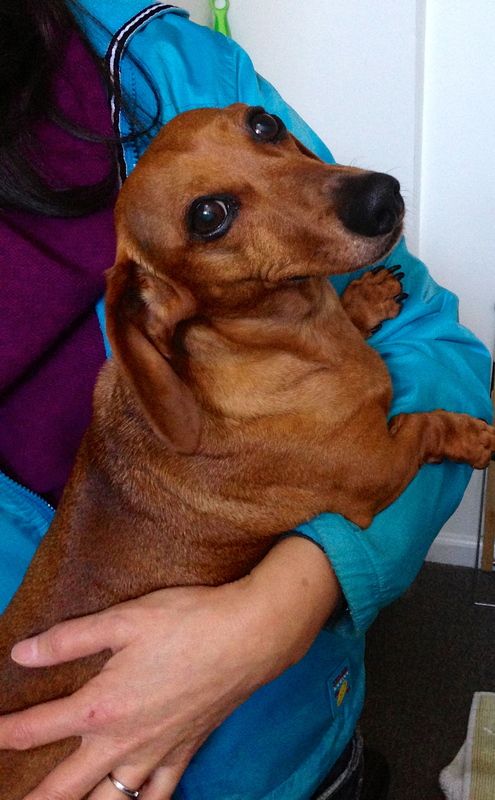 There is a 7-year-old Miniature Dachshund in Westland, Michigan named “Whunt”, (pronounced “hoo-nt”), whose family can no longer keep him because of where they are living and their many work hours. He is a very sweet dog with a loving heart. Recently, Michael Burkey of Michigan Dog Trainer visited Whunt and his owner to get more information about Whunt. The owner said he is gone too many hours per day for work and is unable to give Whunt a good home. Because he is gone throughout the day, Whunt barks for attention which disturbs the other tenants and no one is available to take Whunt outside in his absence. Yet when he is home, Whunt is a very good and sweet dog who loves to cuddle, play fetch and take walks. Whunt prefers women but warmed up to Michael asking him to pet him within five minutes of meeting him. He reportedly barks at other dogs while on walks so his owner believes a single dog home would be best for Whunt. It is unknown how Whunt would behave around children as he is only exposed to young adults in his current home. Please call Dylan at 248-345-3846 (a friend of the owner) to inquire about adopting Whunt. This entry was posted in Uncategorized and tagged barking, Dachshund, dog, dog adoption, dog for adoption, michael burkey, Michigan Dog Trainer, Miniature Dachshund. Bookmark the permalink. How is he with other dogs? and/or children? Hi Caroline, the owner says he doesn’t particularly likes other dogs. So he recommended him to be in a single dog home where he is the only dog. He also said that he preferred women, although he warmed up to me very quickly. He didn’t bark or show any aggression but was just a little shy whereas he wasn’t shy with my wife at all. But within about five minutes, he was asking me to pet him. We don’t know about with children as he was only around adults. He is reactive toward dogs and shy of strangers including children.